Fremont, CA – April 2, 2013 – GammaTech Computer Corp., a major international manufacturer and supplier of innovative notebook and tablet computers, announces that its semi-rugged tablet PC, Durabook model CA10, is now available for purchase. This ultra-mobile tablet comes with a feature package that is perfectly suited for individuals whose jobs take them away from a normal office setting. Workers in such mobile-oriented service industries as retail and healthcare as well as field service workers in the utilities, fleet management, and public safety sectors will find it beneficial. Ideal for Mobile Service and Field-Service Applications The GammaTech Durabook CA10 tablet is an ideal solution for a variety of mobile-oriented applications in both the service and field-service industries. Healthcare: The unit’s semi-rugged design keeps it safe wherever information must be accessed. Its durability and mobile-related features ensure needed patient information and charts are always handy. Retail: A Smart card reader, pin pad device, barcode scanner, and magnetic swipe reader are included for use for applications involving monetary transactions. Utility, fleet management, and public safety field service workers: The CA10’s various wireless connectivity options ensure field engineers and others always have the information they need right at their fingertips. The optional sunlight-readable display allows users to work and record information in extreme light conditions. Perfect Feature Package for On-the-Go Applications The unit comes with a host of features that will make life easier for users. The 10.1″ TFT LCD display has a two-point resistive touch-screen panel. It also supports a convenient digitizer for turning analog touch inputs into digital inputs. A stylus pen is optional. Support is provided for a variety of wireless communications, including Intel Wi-Fi Link 135 and Bluetooth 4.0, as well as several optional offerings. It has hot swappable dual-battery design that offers up to eight hours of power, and a quick menu support for on/off switches for its RF device, barcode scanner, and RFID/NFC; volume and brightness adjustment; on-screen keyboard, and others. Other features include an Intel ATOM (Cedarview-M) processor; m-SATA SSD with storage ranging from 32GB to 128GB; assorted I/O ports; and a docking station with four ports (USB, RJ-45, DC-in, and serial). 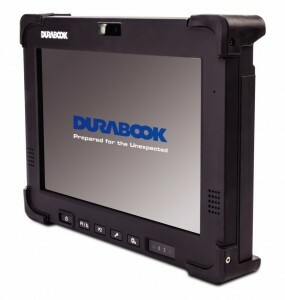 The Durabook CA10 meets IP43 standard for dust and water spray resistance from all directions. It meets Military Standard 810G for drop and shock resistance, withstanding drop tests of up to four feet. It will function in temperatures as low as 0-degrees F.
The Durabook CA10 semi-rugged tablet is available now through authorized distributors and resellers nationwide, and on the GammaTech website. It has an MSRP of $1,299. It comes with a standard two-year warranty. As with all GammaTech products, it may be customized to customer specifications. GammaTech Computer Corporation is a leader in the design, manufacture and sales of cost-effective, high-performance mobile computing solutions throughout North America. Its award-winning line of rugged and hardened notebook and tablet computers are designed and built-to-order to increase mobile productivity for business, government, healthcare, fire, public safety and a host of other entities. GammaTech offers a complete portfolio of products that delivers power and performance needed in the most demanding work environments, resulting in increased productivity and accelerated return on investment. GammaTech is headquartered in Fremont, California, which provides the final assembly, inventory, service and technical support. For more information regarding GammaTech products, or on GammaTech’s built-to-order capabilities, visit www.gammatechusa.com or call (800) 995-8946.